The Turret tries valiantly to bring the mouse and keyboard to the living room, but ultimately fails. Everyone wants a piece of the gaming action happening in living rooms across the world. Apple, Google, Valve, Microsoft, and Razer have tried to pry up a new gaming niche that embraces the television while ditching dedicated consoles like the Playstation 4 and Xbox One. But these efforts have so far piggy-packed on console gaming by focusing on the use of a gamepad. Razer, however, thinks there’s room for keyboard and mouse in this brave new world of living room gaming. 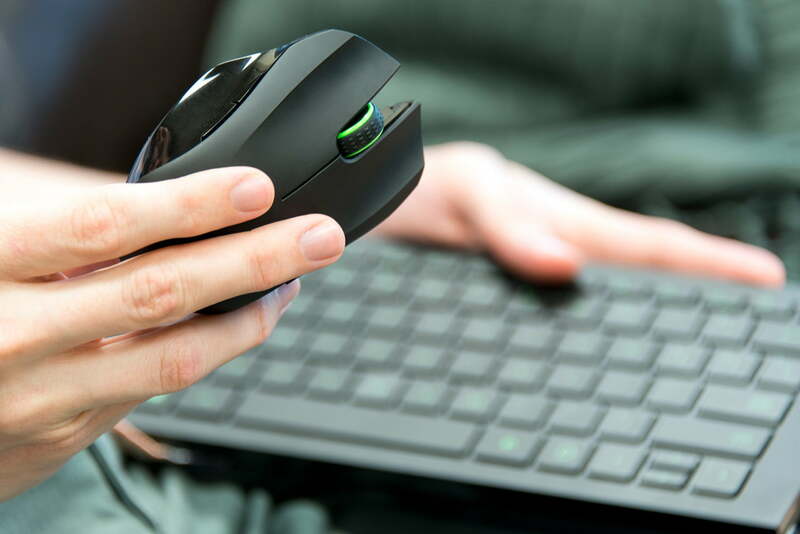 The Turret is its solution — a matched wireless set of mouse and chicklet keyboard, which come together thanks to a unique integrated mousepad and a charging base. It’s not quite like anything on the market, slotting between combination “media” keyboards and more elaborate setups like the Couchmaster. It’s also expensive, at $160 – more than an Xbox One Elite controller, or Razer’s best expensive PC gaming mouse. 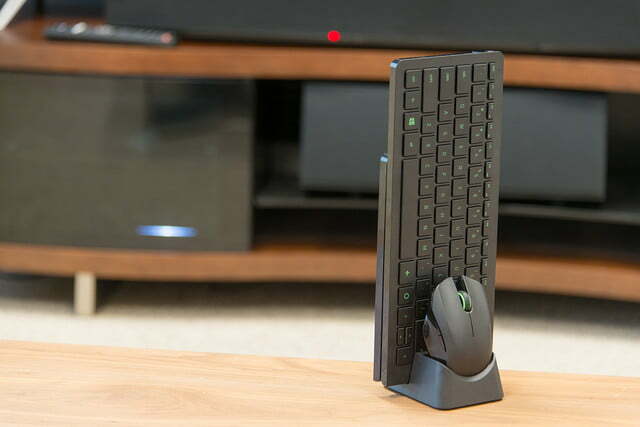 While the Turret was originally envisioned as a companion device for the Razer Forge TV (an Android TV-powered device), its combination of Bluetooth and 2.4GHz RF wireless, plus button support for Windows and Android, means it can serve a variety of setups. 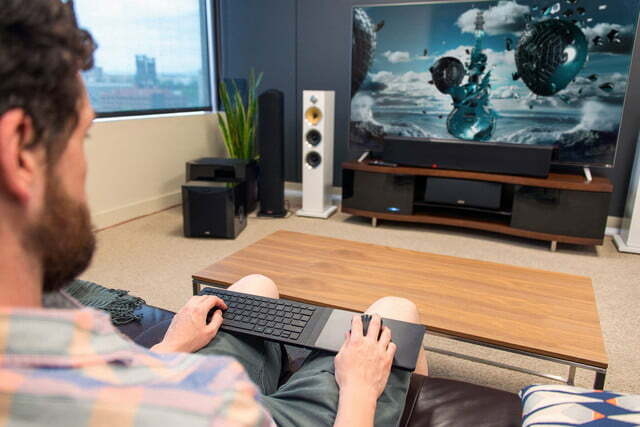 Can the Turret change how PC gamers play on the couch? The largest part of the Turret is the keyboard, which is split into two sections. The bigger portion contains the primary button area, which is essentially a stand-alone copy of Razer’s laptop keyboards. It’s laid out in chicklet style with scissor switch keys (sorry, mechanical keyboard enthusiasts). Opposite the keyboard is a large flat area a little more than half as wide as the keyboard, which includes a raised, magnetized surface for the included mouse. 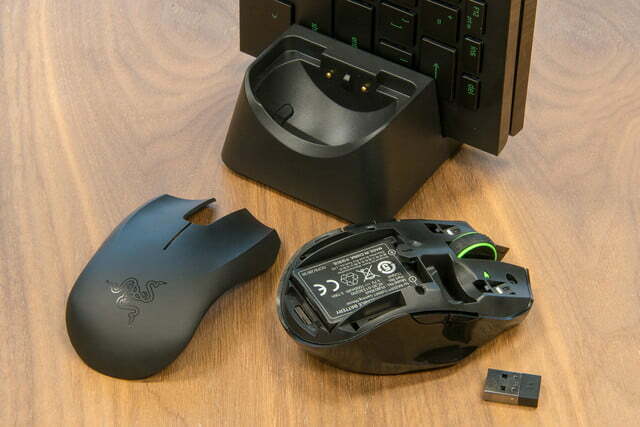 The mouse is a carbon copy of Razer’s Orochi, including the rubberized texture on the removable top, which raises up to hide a storage bay for the 2.4GHz USB dongle (which works for the mouse and keyboard). As a gaming mouse it’s quite small, approximately two thirds of the size of a regular PC version, but it fits snugly onto the Turret’s mousepad with a gentle magnetic pull. 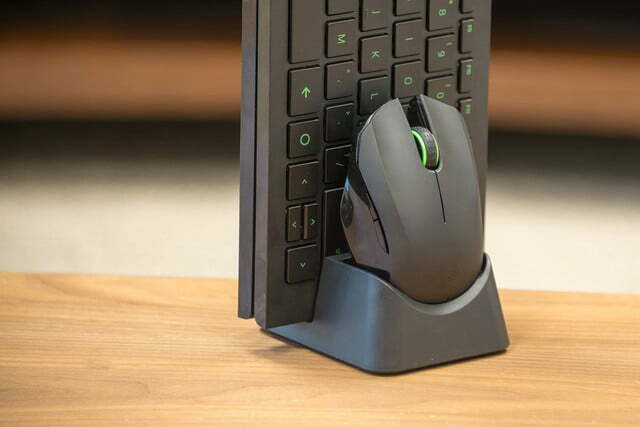 The magnets aren’t powerful enough to make the mouse truly “stick” in place (and gamers wouldn’t want that anyway), but it’s enough to keep it stable at about a 20-degree slant. The Turret’s chicklet keyboard is surprisingly good. When not in use, the mousepad portion of the Turret folds back on itself so that both it and the mouse can be slotted into the included charging dock. It’s certainly a stylish setup that won’t be an eyesore for your living room (assuming you’re the kind of person who doesn’t mind the occasional controller or game box on the entertainment center), and the whole thing is amazingly compact and sleek. The folded out position stays entirely flat with even a small amount of pressure. The Turret keyboard is a pretty good one, at least in the context of the laptop keyboards that it emulates. The scissor switches allow for surprisingly deep key travel, even if they are somewhat “mushy” compared to the more popular mechanical switches, and the standard layout with a full-sized right Shift key makes for easy touch-typing. The left side of the bottom row uses a standard laptop-style Ctrl-Function-Windows-Alt layout, while the right smartly omits Windows modifiers in favor of Android-compliant Back and Home buttons, followed by arrow keys with somewhat cramped up and down buttons. Unfortunately, Razer seems to have neglected some basic considerations for living room gaming. For example, dedicated media keys (or at least a Function row that defaulted to them) would be useful for home theater PCs and Android TV units alike, and despite the almost luminescent green seen on marketing images for the Turret, there’s no backlight function or even glow-in-the-dark key legends. On a combined set that costs $160, more than most streaming video players, we would have expected some kind of backlight functionality. Logitech includes the feature on its K830 keyboard and touchpad set for under $100. The keyboard’s grippy bottom and wide design keep it stable, but its ergonomics are less than stellar. The tight, controlled motions of standard WASD controls require a subtly different posture than merely typing on a laptop, and extended sessions with the Turret are exercises in endurance. The added accuracy of mouse aiming is nice (and advantageous in competitive games), but the simple comfort of using a controller outweighs it for most applications. The mouse is also a study in compromises. Even with the streamlined and grooved Orochi shape, actually playing games with the mouse on the small mousepad (7.5 by 4.75 inches) means more motion is translated to your fingers rather than your entire hand. PC shooter fans will need considerable time to adjust to the angle. It’s worth noting that the mouse’s sensor is an optical (not laser) version, with a DPI that tops out at 3,500. That’s lower than we’d expect at this price point. Want to also use the Turret with a conventional gaming PC? Don’t. Aside from the fact that the small keyboard and mouse setup simply doesn’t offer the best ergonomic option, the mousepad is hinged and not detachable. That means players either have to use the tiny mousepad as a sort of dais during play, or extend both hands to the left and right to account for the extra space – which is uncomfortable, and looks ridiculous. The Turret looks stylish, but if style is what you’re after, an Apple keyboard and Magic Mouse will offer a much better experience at about the same price. Any gaming mouse and keyboard combo (any of them) would be a better option for someone playing on a desk or table. On a technical level, the Turret is interesting. It uses the combination of 2.4GHz wireless and Bluetooth that the standard model Orochi does, but the keyboard and mouse are treated as separate units. In 2.4GHz mode, the mouse is always on or in “sleep” mode, while the keyboard needs to be powered on every time you start using it. We would have much preferred a “sleep” option for the keyboard itself. Flip the manual switch over to Bluetooth on the mouse and the keyboard and the results are the same. It’s possible to use one or the other in Bluetooth mode while the opposite hardware is set to 2.4GHz mode, though there’s no particular reason for doing so. The connection is finicky. While the Turret sat on a desk for PC use it was rock solid in either mode, but when connected to an Nvidia Shield hiding behind a TV the 2.4GHz mode became completely unusable. It’s a good thing that Razer included a USB extension cable with a good-looking base, and planting in front of the television solved the connection problem. Battery life was excellent. Even after using the Turret as a primary keyboard and mouse combo for a work, plus extended gaming sessions in the living room, both components still had plenty of charge left after a week of use. The Turret packaging doesn’t contain any information on the warranty. According to the Razer website, keyboard and mouse bundles are eligible for a standard one year limited warranty with proof of purchase. The Turret is a high-end gaming solution that’s looking for a problem. There’s a reason that almost every attempt to bring both mobile and PC gaming into the living room has eschewed a mouse and keyboard. 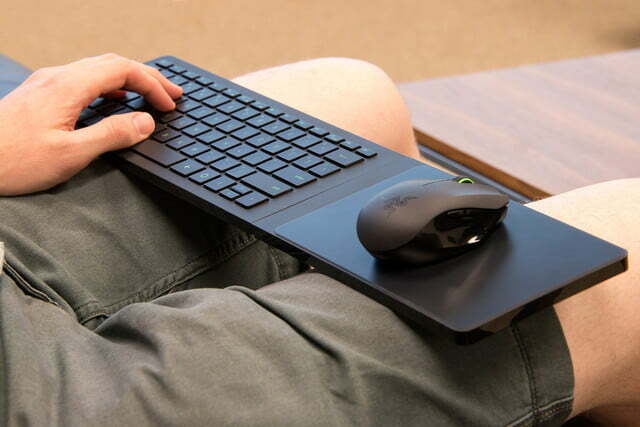 While it makes sense in theory, using a big, bulky keyboard on your lap will never be comfortable. Razer hasn’t miraculously changed that. It falls victim to many of the same faults that plague other, less expensive setups, like Lenovo’s media keyboards. Its rudimentary feature set and high price tag only amplify the Turret’s problems. We understand why the Turret seems like a good idea. Entire genres of PC games – like online RPGs, strategy, and puzzle games – rarely work well with a gamepad. Razer’s effort to make these games playable from the couch is admirable, but it doesn’t succeed.